Punching the cap on our home-crafted wine is a piece of cake. My 9 year old daughter handles it on her own, no problem. 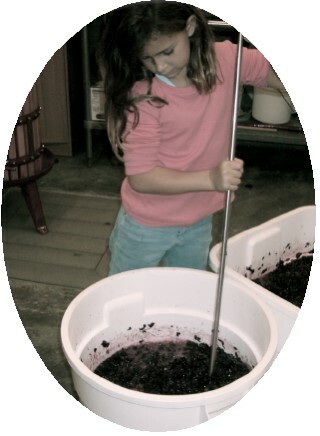 Even at age 7 she could do the punch downs in our own cellar where everything is done on a very small scale. In fact, I would say our cellar is essentially a nano-scaled cellar compared to most licensed wineries. Anyway, the cap is several inches thick and requires so much pressure to punch through it you cannot imagine. Some people make it look easy, but it is anything but. Uzi is working on a more instructional video of punching the cap. In the meantime, here is a less instructional video of me working hard at it. Kudos to all the cellar rats doing this grunt work. Thanks so much for finding me, and the kind words. I’ve already put you on my blog roll as us parental units/wine bizers surely need to stick together. I love that your kids are so involved. Being that I’m based in LA and our wines are made mostly in Napa, they don’t get to participate much. But they are chomping to do so. Hope to trade bottles and/or get together sometime soon! Cheers!